The slow cooker appliance can be an absolute gem in saving you time in the kitchen. Simple chop, prepare and throw everything into your slow cooker and leave for 4, 6, 8 or even 12 hours whilst it does its thing. This is a truly blissful way to cook your soups, stews, curries, lentil dishes, bean dishes and even your veggie stocks. And by cooking things slowly, you are helping to ensure that all that delicious flavour is really soaking and permeating throughout the dish so that when it comes to eat, it is absolutely sensational! Add all ingredients to your slow cooker and cooker on low for around 8 - 10 hours. Serve & enjoy either as a soup or as a topping for potatoes, steamed veggies or as a side with other dishes (depending on consistency). Combine the sweet potato, carrots, celery, leeks, lentils, ginger, 3/4 teaspoon curry powder and 1 teaspoon salt in a 4-to-6-quart slow cooker. Add 6 cups of water (or stock) and stir, then cover and cook on low, undisturbed for 8 hours. At the end, you can stir the soup vigorously with a whisk to make a very rough puree and thin with hot water, if desired. To finish it off, melt some butter in a small skillet over medium-high heat. Add the garlic and the remaining 1/4 teaspoon curry powder and cook until the curry powder is slightly toasted, about 1 minute. Stir the curry mixture into the soup and add the lemon juice, cilantro, and salt to taste. Serve with lemon wedges. Rinse and soak beans overnight. Drain the beans and put in a pot on a low - medium heat with 6 cups of water whilst you put the other ingredients into the slow cooker. Add all ingredients to the slow cooker and whisk them together until smooth.Add beans and cook on low for around 12 hours. Start checking at about 8 - 10 hours. If it is looking too runny, you may need to turn your slow cooker on high and remove the lid until you get that thick and sticky type consistency. 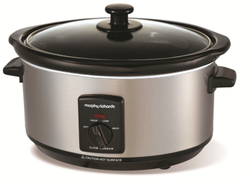 Each slow cooker has different temperatures so this will depend on your slow cooker. ** For a slightly better taste, you can also use an equal amount of soaked chickpeas. Just be sure to soak these overnight or for 8 - 12 hours. Heat the oil in a skillet over medium heat. Sauté the celery with a teaspoon of salt, about 3 - 5 minutes. Add the potatoes and another teaspoon of salt, and sauté until just translucent around the edges. Stir in the curry, brown sugar, ginger and chili and cook until fragrant, about 30 seconds. Pour in 1/4 cup of broth and scrape the bottom of the pan and then pour this onion-potato mixture into the bowl of your slow cooker. To the slow-cooker, add the rest of the broth, chickpeas, bell pepper, cauliflower, tomatoes with their juices, the pepper, and the final teaspoon of salt. Stir to combine. The liquid should come half-way up the sides of the bowl; add more broth as necessary. Cover and cook for around 4 hours on HIGH. At the end, stir in the spinach and coconut milk. Cover with lid for 1 minute to allow the spinach to wilt. Taste and adjust salt and other seasonings as needed. 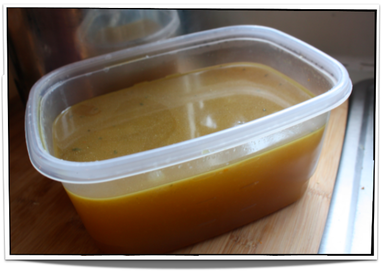 ** There is no need to use expensive vegetables to make your own veggie stock. We make our delicious tasting stock every week by simply using veggie scraps and peelings that would otherwise be thrown away. This includes: carrot peels, lettuce ends, cucumber ends, ginger skins, tomato tops, carrot tops, broccoli stalks, cauliflower stalks, celery leaves etc. As you go about your cooking during the week, store any vegetable off-cuts in a plastic bag or container and store in the freezer. When it becomes full or you are ready to make stock, simply place all these frozen ingredients into your slow cooker, cover with water and cook on high for around 3 - 5 hours (depending on your slow cooker). Now drain the liquid out and store this in your refrigerator. Discard the cooked peelings etc into your compost (or to the chickens).